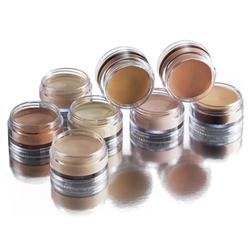 Ben Nye MediaPro Concealers create flawless complexions utilizing low luster, micronized pigments for a natural finish. All offer exceptional coverage to conceal birthmarks, under-eye discoloration, facial blemishes or body art. Mellow Orange is designed to cancel intense red due to bruising, acne, birthmark, or capillaries. Use before base as a facial corrector, or blend with other neutralizers. Special Yellow Highlight No. 1 is used to blend with other creme products, lightens without greying. Attractive highlighting shade. Red Neutralizer is an exceptional shade to neutralize blue-greens including veins, tattoos, bruises and deep under-eye discolorations. Available in three shades: MO-11 Mellow Orange, NR-2 Red Neutralizer, and Special Yellow Highlight No.1.